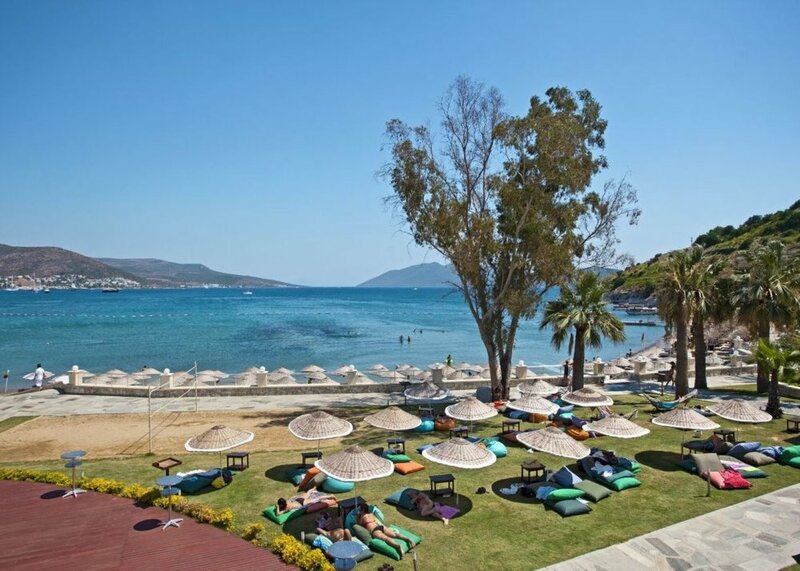 Situated between Bodrum and Gumbet with its own stretch of private beach, this modern hotel enjoys spectacular views of Bodrum bay and the famous Crusader castle. It offers comfortable accommodation and a range of facilities that will appeal to couples and families alike. The hotel is located in an elevated position overlooking a stretch of course sand and shingle private beach, and is 1.5km away from the town centre which can be reached by water taxi or local dolmus. The hotel’s sea-view buffet restaurant showcases a wide range of local and international dishes, with both indoor and outdoor seating available throughout the year. The a la carte restaurant specialises in delicious fresh seafood – and for those with a sweet tooth there’s an in-house patisserie offering a variety of baked goods and pastries. Each room contains twin beds and double bed, with the possibility of adding another bed. Floors are covered with carpets or ceramic tiles, direct dial telephone & telephone in bathroom, TV (satellite system) including 1 music channel, air-conditioning, hair-dryer all rooms with bath or shower & toilet, minibar, safety deposit box. Some rooms have (65%) balcony & seaview with supplement and (35%) garden view. WHY NOT EXTEND YOUR HOLIDAY WITH A STAY AT THE salmakis resort BEFORE OR AFTER YOUR GULET CRUISE? PRICES FROM £70 per person per night A/I.